On a recent ‘Date with Jesus’ (my name for Pastor Dan’s “A Day with Jesus”) our Lord shared his heart with me in a unique way. These extended times with Jesus are opportunities to hear from him what may not arise during our devotional times. Because the discipline of solitude and silence have been life changing for me ever since I was introduced to it during the WELL Discipleship ministry, I’m grateful for the opportunity and accountability A Day with Jesus provides. Though we are given time to spend any way we choose, I appreciate Pastor Dan’s guidance in providing a short devotional and some direction. As Pastor Dan spoke on Jesus calming the storm, we were invited to dwell on an area where we might be experiencing a challenging time or ‘storm’ in our lives. As I took a break from my journaling, I waited to hear how Jesus might respond to what I wrote. I closed my journal and was drawn to the cover illustration designed by Irene Mar. She placed Romans 15:13 over an illustration we often share in the WELL Discipleship ministry which was shared with us by Vera Christian as she taught out of Chuck Miller’s book entitled “The Spiritual Formation of Leaders.” This image has ministered to me for over a decade and is now used in the WELL Discipleship. “May the God of Hope fill you with all Joy and Peace as your TRUST in him, so that you may overflow with hope by the power of the Holy Spirit.” This verse illustrates the concept of God (the pitcher) pouring into us, (each a unique cup), his fullness and power of the Holy Spirit which overflows onto the saucer (family, close relationships), then the plate (ministries, programs, organizations, the world). Over the years, this illustration has guided, convicted, and encouraged me in many different ways. This model for ministry revealed my need to position myself under the pitcher so I could receive from God and be filled. Ten years ago, my cup was not full as I was running around ‘doing’ what I thought were ‘good works’. I began to burn out from striving to ‘please/serve others’ instead of my Lord and Savior. 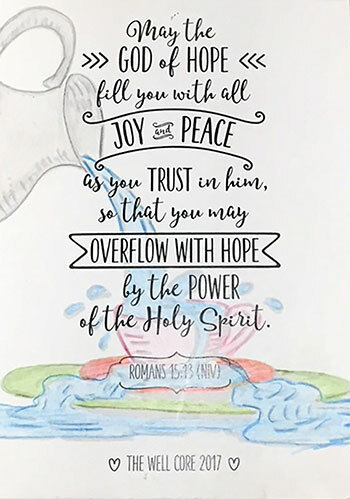 As I dwelt on Pastor Dan’s question regarding a storm/challenge in my life, I asked Jesus to show me how to find hope in an area where I was not experiencing a lot of peace and joy. My focus fell on the words in the middle of the verse that is enclosed in the banner on the cover, particularly the word “OVERFLOW.” I sensed he was asking me to review the ‘loving acts’ I felt were being misunderstood, or rejected and check if they were out of his overflow and love or something else. Did I ‘add’ other things into the cup (my ideas, expectations, extra touches) that alter the unconditional and pure love that He desired to pour out to others? Do I, as a cup, pick myself up thus taking over control and pour out the love before I’m even filled? He reminded me of past instances where my ‘loving acts’ were met with indifference or even rejection, which then led to frustration and sometimes hopelessness on my end. I realized that even though I sought to do or say what I thought was loving, those actions were sometimes mixed with my ideas and ‘additives’ like of guilt, obligation, pleasing others, etc. The love that overflowed onto others was not the ‘holy, pure, unconditional’ love that originated as the perfect love of God’s pitcher. If I desired to pour out the free, overflowing love that is received well by others, it has to remain HIS. He was showing me how transformation takes place and how the ‘fruit’ of the Spirit truly blesses others. During our ‘date’ although Jesus revealed and convicted me in an area of sin, he also restored and invited me to receive from Him the living water that can refresh not only me, but all who it overflows onto. Is that a refreshing date or what?